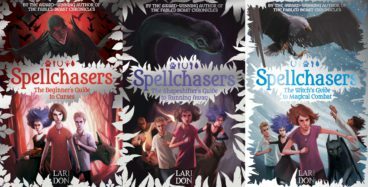 In this exclusive article bestselling children’s author Lari Don muses upon endings – both in her writing and in the changing seasons – as the final instalment of her exciting Spellchasers trilogy is published. And, like the changing seasons which lead onto renewal and growth, she finds that endings should be embraced as they are an essential, and indeed joyful, part of the creative process. Autumn is about endings. About leaves falling and all the growth of spring and summer fading away. 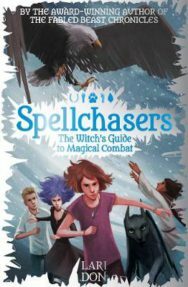 I’ve been thinking a lot about endings recently, because the third book in my Spellchasers trilogy (The Witch’s Guide to Magical Combat) has just been published. The end of a story has to be perfect. Of course, getting the beginning right is important, to hook the reader. But getting the ending right is vital. The end of a book creates the feeling that the reader takes away, the last memory and enduring sense of the story. If the ending doesn’t work, the story hasn’t worked. From a practical point of view, if the ending isn’t satisfying, the reader won’t want to read your next book, or recommend this one to anyone else! 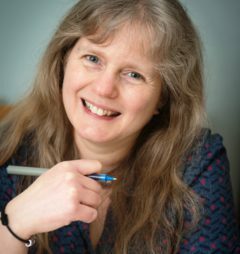 From a creative point of view, if the ending doesn’t answer the question asked at the start of the story, what was the point of everyone – writer, characters and reader – going on the journey? Like almost everything else to do with a trilogy, writing the ending is a lot more complicated than writing the end of just one novel. In a trilogy, the third book is the ending, but it also has to be a story in its own right. 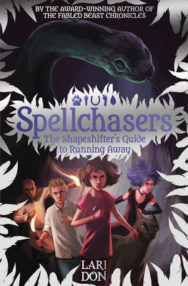 I wanted Witch’s Guide to feel like a continuation of the Spellchasers story, but in a new and surprising way. I aimed to write a story with its own shape and flavour, but also bring the wider story of the whole trilogy to an end. I had fun writing a third adventure with a team of characters I love. But I knew I had to finish it. I had write a last battle. A last problem. A last chapter. A last page. A last line. And I hadn’t been writing towards that last line for a year, like I had with my other novels. I had been writing towards that last line for more than three years. The trilogy turned out to be about a choice, about how my main character – who began the trilogy cursed to turn into a hare, but found the ability to control her shapeshifting – would decide to use the magic she’d discovered. Most of all, I hope it will be satisfying. I hope it will feel like the perfect end. So I’ve reached the end of my time with this trilogy and these characters. I’ll read from the books at festivals and in schools, and answer readers’ questions about their favourite characters. But I’ll never write about them again. I won’t send them on quests, or put obstacles in their path, or wonder what surprising decisions they will make when I confront them with danger. I’ve reached the end of my journey with the Spellchasers team. But, just like autumn and winter lead to spring and summer, and new life stirs under fallen leaves, I hope the beginning of the next story is starting to grow slowly and tentatively in my head. Because the end of a story is important, of course it is, but perhaps the start of the next story is even more exciting? Lari Don’s new book The Witch’s Guide to Magical Combat has just been published by Floris Books. 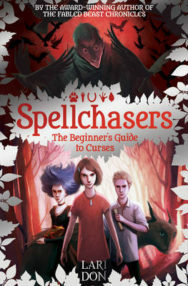 Find out more about the Spellchasers trilogy, visit Lari’s website or find Lari on Twitter. 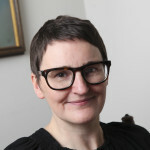 You can read many more articles by Lari on Books from Scotland – have a look here.